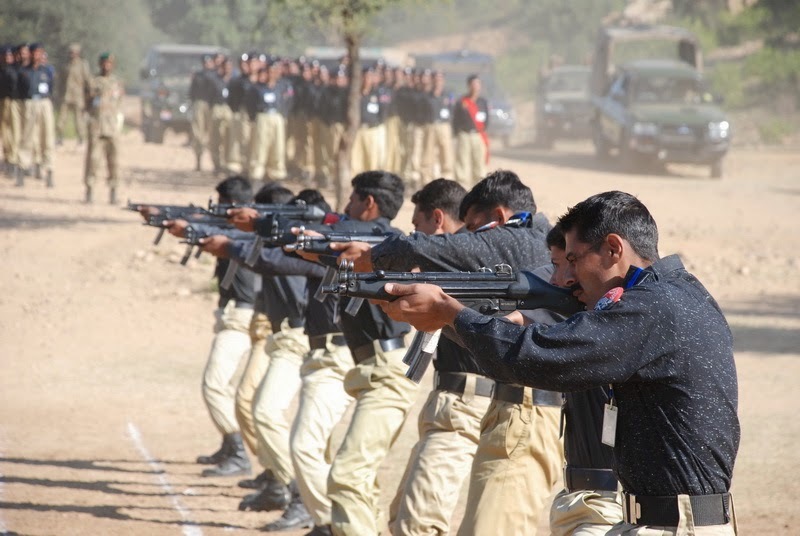 August 2014: Police forces in Azad Jammu and Kashmir are being strengthened to enhance its professional skills under a broad-based development plan in line with the needs of the modern age, disclosed the AJK police chief. Talking to newsmen at PWD Rest House, Inspector General of Police Malik Khuda Buksh Awan said that the police force had been imparted the latest professional training related to all the disciplines and course including the anti-riots training. He revealed that the police had also been equipped with latest weaponry including shields for defense and helmets besides the latest swift means of communications. Flanked by SSP Mirpur Raja Urfan Salim and SSP Security for Chinese in Mirpur district Sheheryar Khan, the AJK police chief said that the police force had also been dispatched in required number to Islamabad to join the local law enforcing agencies to deal with any eventuality following the ongoing marches staged by the PTI and PAT. The IGP said that in view of the increased population and rapid progress and development in all the fields in AJK, immediate improvement in the police strength was the need of hour to maintain the sense of complete security among the masses. Awan said that the number of ladies police would also be increased in line with the international standard to ensure improvement of its professional performance. He said that recruitment for the ladies police force in AJK was being increased from 5 to 15 percent. To a question, the IGP said that the surveillance of non-state subjects pouring in AJK was in progress and the police would unearth those involved in crimes in their home districts or other areas. He said that the registration of non-state subject residents in Mirpur division and rest of AJK was also in progress to watch the anti-social activities of the unscrupulous and mischievous elements. The move, he added, is primarily aimed to eliminate such anti-social elements from their roots to maintain overall peace and order in the area. To another question, the IGP said that police exercised the detailed scanning to unearth the non-registered Afghan nationals in AJK or whom registration by Nadra had been expired. Such non-registered Afghans were rounded up under foreigners act in various parts of AJK including Mirpur district aimed to discourage the unlawful presence of the unauthorised illegal foreigners in the region, he said. “The plan involves a special package of the reinforcement of AJK cops on all the seven entry and exit points of AJK facing the neighbouring Punjab and KPK provinces to discourage the influx of the proclaimed offenders and vagabonds and the non-registered Afghan nationals into AJK, he said. He added that standard operating procedure for ensuring the complete security of the sensitive key installations across AJK had also been devised. Reported by The Nation.